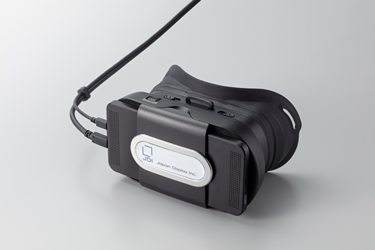 Japan Display Inc. (JDI) today announced that it has developed a VR head mounted display, VR HMD (JDI product name: VRM-100), with an LCD panel developed exclusively for Virtual Reality (hereinafter 'VR'). With current VRHMD products, they are broken down into high-end products for games, with high definition display loaded with various sensors and controllers, and products that are reasonably priced, sacrificing display functionality. And even when experiencing high-definition VR contents, not being used for games, in order to resolve the issue of having to purchase a high-end product, JDI has begun to develop and sell VRHMD, specializing in display quality, such as high-definition etc. 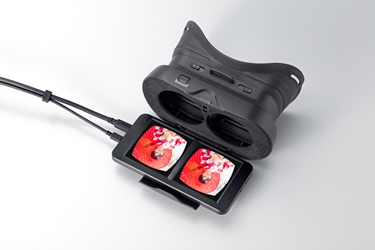 With VRM-100, the VR monitor unit, with high definition LCD panel and a gyro sensor, using VR goggles, allows people to view high definition VR movies. The attached VR goggles are made so they are detachable, since they are so easy to clean, they can be used, even in an environment where multiple people use them, such as in stores or at exhibitions, in a hygienic manner. We focused on being able to view high definition VR movies, getting rid of the external head tracking sensors and controllers, mounted on VRHMD'S, for normal PC’s. At JDI, to date we had only been focusing on the development, manufacturing and sales of VR dedicated LCD displays, however, we are expanding into the VRHMD realm, to contribute to the expansion of the VR market. Furthermore, VRM-100, for the time being, will be sold, being limited to developers in domestic corporations. We plan on accepting reservations from December 3rd (Mon. ), with the product scheduled to start shipping out from the middle of December. This products is for Japanese domestic corporations. The above external dimensions and appearance and specs may be changed at anytime. VR experimental session, KYUSHU SANGO Univ. 28th annual LCD/organic EL/sensor technology exhibition "2018 Finetech Japan"